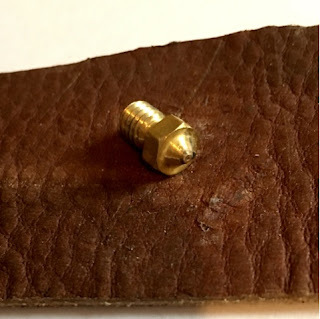 I use a piece of smooth leather (an old piece of belt works great) as a strop and put the tiny tiniest dab of brass polish on it (for both brass and SS nozzles). A piece of old denim works great too - I even use the jeans I'm wearing if I can't find the strop! Lay the leather on a hard surface and briskly and lightly rub the tip of the nozzle on it. I use a circular rocking motion so as to "polish" a slight curvature to the very tip of the nozzle (the E3D nozzles work great with this). See the attached photo. Notice that the edges around the flat area around the orifice is very slightly rounded and the edges are rounded over slightly. You'll find your first layers will go down much more smoothly and your top layers will look much nicer. After the initial polishing, you can touch up the nozzle with it installed in the hot end. Use a leather strop without polish and just take a swipe or two across the nozzle tip. To test, I created a simple "single layer test" file. It's simply a 75mm cylinder .2mm tall (representing a very common single layer height). It is a great object to test and refine your first layers and test the effect of polishing. 9 comments to ''Polishing nozzles for improved layer quality"
good post!the article about Polishing nozzles for improved layer quality you can find at zjautoparts.net.it may be help you more! Considered using leather as a wipe station on your printer? I have but it is quick enough to do it manually. A wipe station also subtracts from the workable print area and I do sometimes print some large or a number of smaller things on the entire print surface. It's worth thinking about as part of an integrated purge/wipe station though. Thanks! Hello Michael, it would be great to read a review from you comparing brass, hardened steel, stainless steel and copper nozzles. I'm minutes away from ordering the Titan Aero and was considering adding a copper nozzle and block to the order, but it might be pointless since I don't print with high heat filaments. Thanks for the idea Martin, I'll add that to my growing list of posts! It would be helpful to see the before pic of that nozzle. Would really drive home your point! It is not possible for me to take a picture of a nozzle so that you can make out the "before" details. This isn't rocket science! A couple of strokes on the leather or denim and you'll see the polish and slightly rounded corners.